You like? This is between a sneak peek and a casual introduction. Don't know a word for that. We received the fabrics yesterday afternoon, except for 2 additional patternns that are coming soon (I hope). It's been a whirlwind ever since. But, even amidst the hubub I just had to stop and at least let you see what I've been up to. Drop me a note and tell me what you think. Okay, gotta sew. The bottom picture. The yellows and blacks with gray and a hint of red. That's speaking to me. Love it! So incredibly lovely. The stripes look just fabulous. And the top one, in the center photo, the color combo is really super. My eye twinkled when I saw the aqua stack but when I scrolled and saw the greens (my favorite color)I got a big smile and then further down the black/grey/yellow is just stunning. I just bought yellow and grey solids for a project. LOVE THEM ALL! Oh the purses and bags I'm imagining. Great combination of colorways! They will all work together beautifully! I especially love the fancy floral with butterflies with the blue background! Cute, cute and more cute. I love the colorways. Lots of possibilities, can't wait to see what you are sewing! Oh wow! Love it! It looks like you have an animal print in bright colors. Too cute! I will definitely be ordering this for my shop! I follow you on Twitter and saw that you got your fabrics yesterday. I was hoping you would show it off today! Love your new fabrics...I can't decide on a favorite colorway. I am loving the greens/blues!!! YAY! So excited about the new line. I LOVE the green! When are these available at MMF? I'm ready now! Thank you all so, so much! These will certainly be ready to order at Market. WOW!! Those colors are amazing! I can't wait to turn your fabric into bags, and dresses! I have the perfect pattern for that middle colorway.....drool! OH so lovely Paula! Very different from Flights of Fancy-good job! The rose one is my favorite. Oooh, NICE! I think the black and whites are my favourites. LOVE LOVE LOVE!!!!! The zebra, the dots, the floral..LOVE! Your fabric inspires me...absolutely love it!!!! The fabrics on top of each photo are all three beautiful! I love them! luuuuurve the black and white in the last pic!!! need it in my shop. haven't seen anything like it for spring! just lovely!!! I always love getting to mix black in with bright colors especially pink and turquoise! These are beautiful - I am in love with the zebra stripes in the different colors! My stash will be made fatter with the addition of them, for sure!! I'm loving the aqua and greens together! 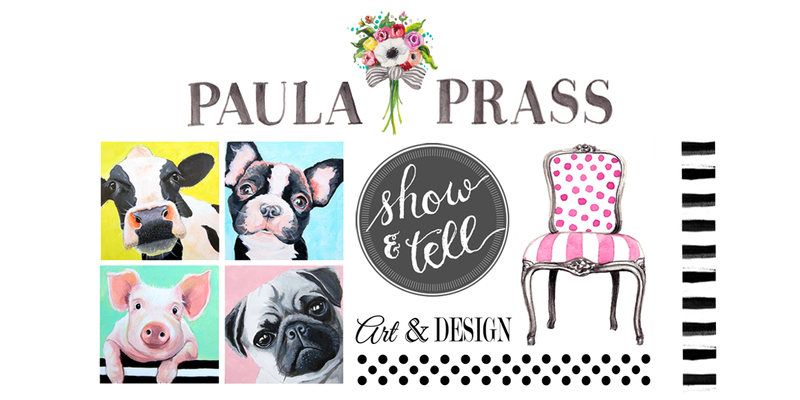 I'm so excited Paula, great job! I love it all!!! Really love the yellow. 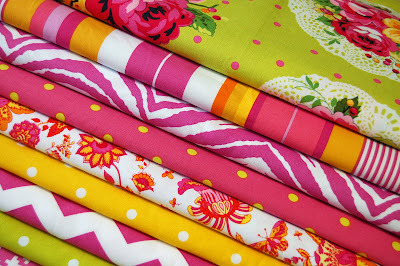 I love these new fabrics...they are gorgeous!!! And I recently had a giveaway for a bag I made with your Spring "Flights of Fancy"--I had over 210 people trying to win that bag!!! already obsessed.. when and where can we buy? It is so summery and beautiful! The colors are fantastic and the blend of prints is perfect. I was inspired by your shoe post the other day and got some cute orange shoes today-they are on my blog. Thanks so much for your sweet words on my lay off. Everyday I hear of someone else getting laid off and it is sweet words like yours that help it feel a little better. They take my breath away! They are so gorgeous! I was just getting ready to go to the fabric store to start stashing for a quilt but now I think I might wait for this to come out! Oh, Paula, they are fabulous! Wow these prints are amazing! So beautiful and full of color! Beautiful!!! I love them all but the blue and green group is the very most fabulous!! The top floral and the stripe are calling to me. So I see you are in Carmel! One of my favorite places to be. We were just there on Monday. But I was so frustrated not to find a fun fabric store in Carmel. Are there any stores locally that carry your fabrics? Oh, and Happy Birthday (Jona, at Stop Staring and Start Sewing, said it was your birthday). I pray the Lord blesses you big on your special day. Don't know what else I can add to the previous 35 but wow, they look great! *swoon* Oh, Paula. I'm totally in love. Wow!! They are all soo beautiful! Way to fuel my fabric obsession! I can't wait to get my hands on these! Wowza! I'm absolutely lovin' the black/white/yellow and OMG the grey! I have a lot of vintage cottons and I'm always on the lookout for the greys. Congrats on such a fabulous line! Oooohhhh Love, Love, Love it! congrats on a beautiful line up!! LOOOOOOVELY PAULA!!! I love all the bright colors!!! I can't wait to get my hands on some of your gorgeous fabrics. Paula!!!! Brilliant again!! I could just sink my teeth into them! Can't wait till they are accessible! I think I am in love! Each colorway has such a different feel, I can't wait! Holy crow! Your colors are fantastic! Oooooo aaaaaah! I love all of them! Thanks for the sneekaduction or intro-peak! And, Happy Birthday! Well you know I love them! I can't wait to start creating with them. I am so looking forward to it, Paula! Oh, and to see them all stacked like that is so much better than on paper!! Love them! Paula, they all are divine! Each color way are just lovely! Can't wait to see it at market! Oh my gosh! Jackpot! Ilove the yellow/black line. I can see a tunic, a purse....so many ideas! These are GORGEOUS! They are all so lovely & fun & bright! Oh my! I'm in love. The first 2 are my favorite. Beautiful! Wow! I'm dizzy with excitement over these! Wow! So pretty. You're very talented. I just saw this and am excited to fully see them all -- I love the colors, the roses, the animal prints! BE STILL MY HEART. Totally and completely IN LOVE!!! 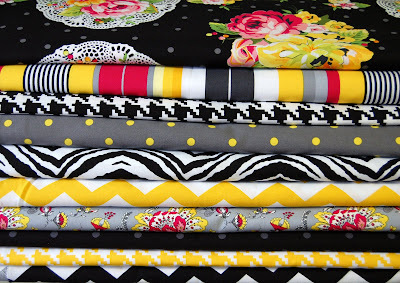 Just painted the family room yellow and can't wait to decorate with these fabrics! 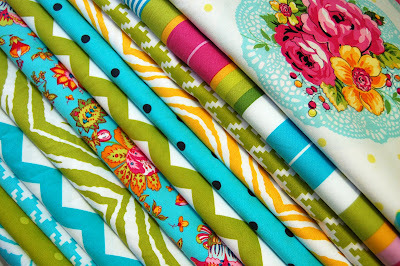 Oh -- I love these fabrics!!! They are so very beautiful, vibrant, cheery, and just my style! I will need to get my hands on some of that! OMG, the black/white/yellow colorway!! I have to have some of that. BE*U*TI*FUL!! they look fabulous! the blacks and yellows are delish! Gotta get me some of that! Oh I love them all!!! Great job! Gorgeous, all of it! I'm especially loving the colorful zebra and pixelized houndstooth prints, wow, just so fabulous! Can't wait! i can't wait until it hits the shops! my college bound daughter wants her room designed around your fabric. thank you, thank you! O*M*G! I'll be stalking the shops for these! I'm totally smitten and can't wait to get my hands on these.